Given the state of the economy these days, buying bling is out of the question for most people. Fred Flare has a poor man version that makes it affordable with a sense of humor. 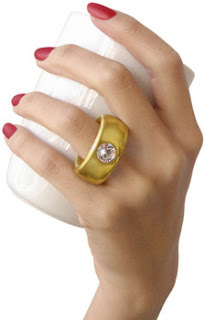 This 2 carat ceramic cup has a ring shaped handle adorned with a real Swarovski crystal. Makes quite a statement when you drink your cup of joe in the morning.